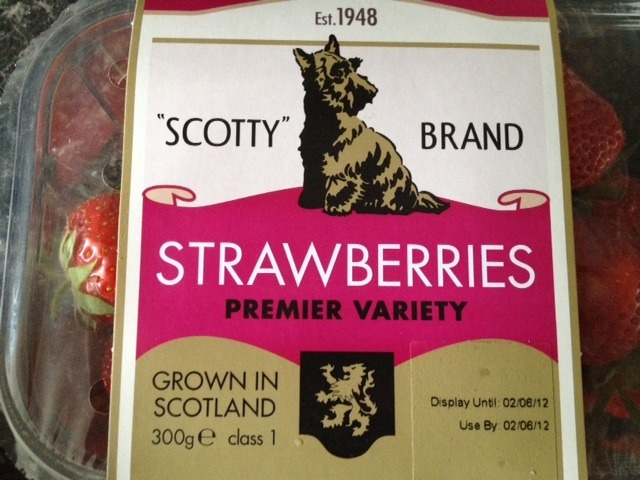 A few weeks ago we were sent some of the most delicious strawberries I’ve ever tasted from the lovely Scotty Brand. Honestly the entire box, each strawberry was sweet, juicy and delicious. 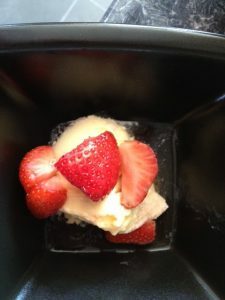 We were sent them to try out a delicious strawberry cheesecake recipe which you can see here. My boys aren’t big cheesecake fans and hubby is gluten intolerant so I gave this one a miss and decided to go for something else. 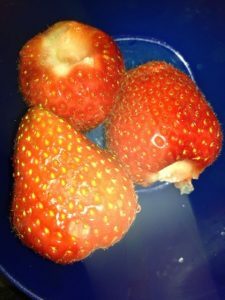 I wasn’t sure how many strawberries were going to survive with the boys eating then bowls at a time. To be fair to them I was finding myself munching on them. Just look at how good these strawberries look? Perfect isn’t it. And they were all like this. 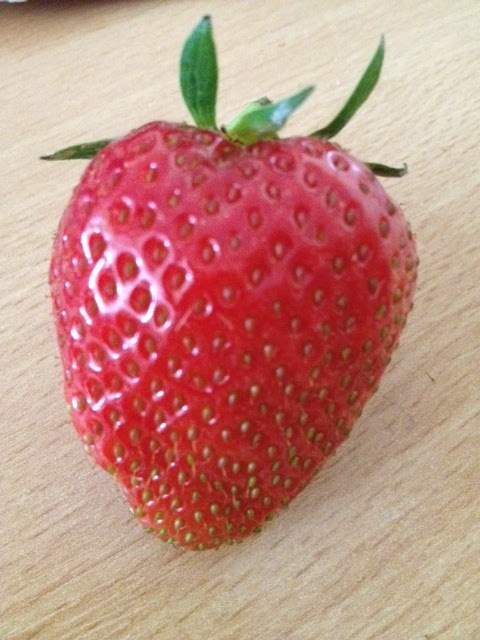 Not one bad looking strawberry amongst them. 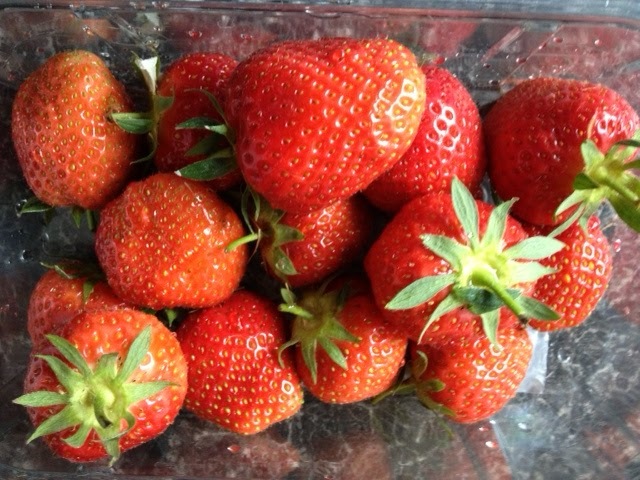 These strawberries are perfect just washed and the stalks removed. Even halved and severed chilled in a bowl. I decided to go for some different types of flavours with strawberries. 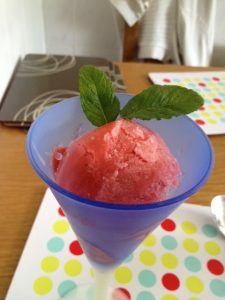 I made some Strawberry sorbet for starters. 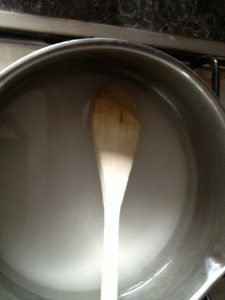 I added the water and the sugar to the pot and brought to the boil and then let it simmer for 5 minutes. Take it off the heat and allow to cool down. 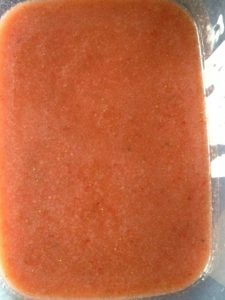 While simmering I put the strawberries in a blender and blended them down. 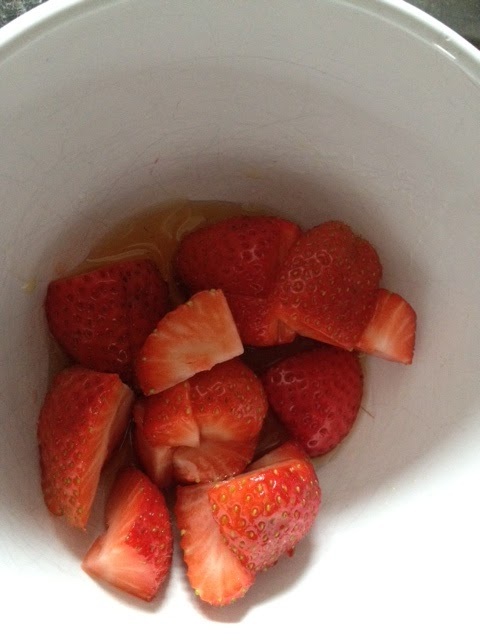 I added the water mixture to the strawberries along with the the Lemon juice and the alcohol. The alcohol helps stop the sorbet from freezing completely. I put it in a container ready for freezing. Into the freezer it goes. I took it out just before serving and served up in some lovely blue glasses. I went for the red and blue theme for the jubilee. With a few leafs of mint for decoration. Here’s my finished product. What do you think? It got a big thumbs up from the boys and hubby. I loved it. Very tasty and will definitely be making it again. I also went for some different flavours to add to the remaining strawberries. For some I left them in a bowl with some Amaretto overnight to steep. For these I served them up with some ice cream. These were my favourite and I kept them all to myself. Lastly I went for a variety plate and served up some strawberries with some balsamic vinegar and icing sugar with a little bit of black pepper to dip some into. 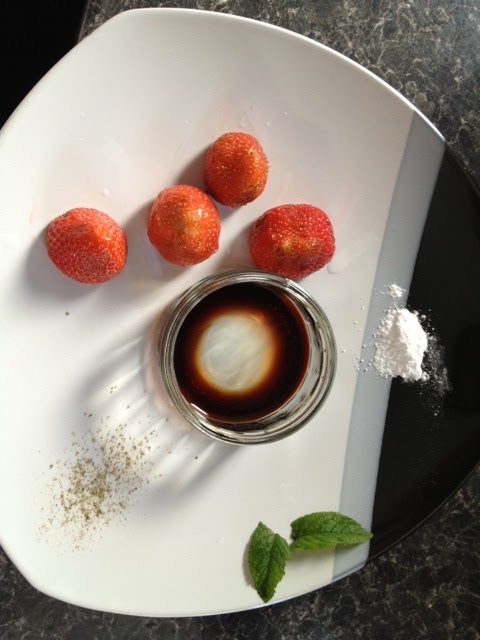 For the strawberry and balsamic, you dip the strawberry into the balsamic vinegar and then into the icing sugar. It is sweet and tangy and delicious. Another strawberry can be dipped into the black pepper which brings out the flavours in strawberries perfectly. I loved all these flavours and it was great fun to try. What unusual ways do you eat strawberries? Scotty Brand products are excellent and I will be making more dishes with them, please watch this space. 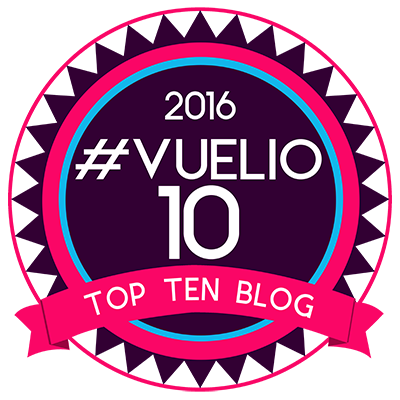 Have a look at their website for more inspiration. Also their facebook and twitter accounts have further information, so make sure you’re following. 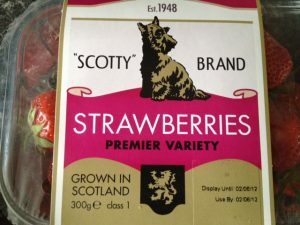 Disclaimer:- I was sent some boxes of Scotty Brand Strawberries to try out some recipes, I have not been paid for this post and the opinions expresses are my own. I have included links out of courtesy for a brand I love.